Browse through the cards and stationery section to find photo greeting cards, calendars and various stationery items. All articles are fully customizable with photos and designs, with added text optional. 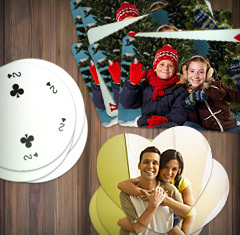 Choose from 3 different shapes and customize your own set of photo playing cards. Available in single design (personalized back of card) or a set of fully customizable deck which allows you to print on both the back and front of the playing cards. Made from 280gsm paper, card quality is ensured along with printing on our industrialized digital color printing devices. You have the freedom to create a set of DIY cards. Ideal for making learning cards and self-designed card games, you can use your inspiration and compose a deck for whatever purpose you can think of. Printed on quality paper, these photo cards are perfect for children’s learning and educational cards or simply novelty business cards. Create personalized photo birthday cards, holiday greeting cards, announcements and fancy invitations with our customizable photo cards. Available in two sizes and with envelopes included, use photo cards to keep in touch with friends and family. 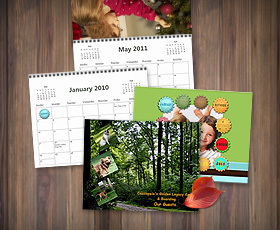 Choose from either the 12 or 18 months calendar templates. You can select the month which the calendar begins for added convenience. Make note of special dates onto your wall calendar and personalize it with photos or use our template designs. Apart from our range of photo cards, we also have photo stationery items for company. Select from hip and trendy metallic business card holders and customizable letter openers to compliment your other office equipment.